Home › Forensic Science › Who put Bella down the Wych Elm? When a woman is murdered in the prime of her life and her body is left unidentified the story tends to capture the attention of the public because the mystery of her death is compounded by the apparent lack of loved ones to report her missing or claim her remains. Her life and homicide become a blank slate on which people speculate and spread rumors filled with romanticism, scandal, or conspiracy in an attempt to understand what happened. “Bella in the Wych Elm” is an example of the public’s morbid fascination with the murder of a young woman and how the enigma of her case can take on a life of its own. People purposed all sorts of weird theories that involved witches, ritual sacrifice, a Hand of Glory, German spies, even a trapeze artist. On April 18, 1943 four boys were out looking for birds nests in the Hagley Woods of Worcestershire, in the West Midlands area of England, when they came across an elm tree. Locals referred to this tree as a Wych Elm because they thought it was really creepy-looking (pictured here). One of the boys climbed up and looked inside the hollowed out trunk and found a human skull looking up at him. Although the boys vowed not to tell anyone about what they discovered, the youngest boy was so disturbed he told his father who in turn contacted the police. The Warwickshire Police went out to inspect the Wych Elm and recovered a mostly complete skeleton, fragments of clothing, crepe shoes, as well as a severed hand buried nearby. The skeletal remains were examined by Professor James Webster, a forensic scientist at the University of Birmingham, and concluded that the bones belonged to a woman between 35 and 40 years old, about five feet tall, who gave birth to one child, and had irregular teeth. Because Webster found a piece of taffeta stuffed inside the woman’s mouth, he surmised that the she had been murdered by asphyxiation at least 18 months earlier. He also believed that the body had been disposed of in the elm shortly after death because her body would not have been able to fit if rigor mortis had set in. Investigators used the post-mortem info to try and identify the body. They cross-referenced the description with missing persons reports from throughout the region, but none matched the Wych Elm skeleton. Because the woman’s teeth were so distinctive, they also contacted dentists all over the country to see if they had any patients that had the same teeth. None of these searches provided any results. 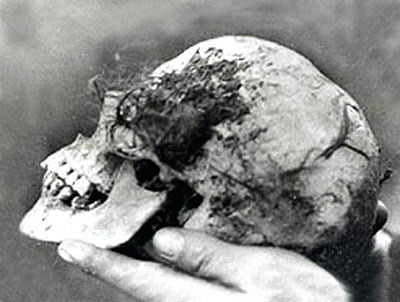 The murder investigation was widely publicized and the press started calling it the “Tree Murder Riddle.” Six months after the bones were found, graffiti messages that said, “WHO PUT BELLA DOWN THE WYCH ELM-HAGLEY WOOD?” appeared on buildings throughout the West Midlands area, particularly Hagley and Birmingham. Police searched for the vandal(s) because the graffiti implied that someone knew the identity of the woman and had some leads on her homicide, but the police failed to find out who the mysterious graffiti artists were. However, the graffiti gave a name to the unidentified body and she was referred to as “Bella” from that point forward. Two years after Bella’s body was discovered, Margaret Murray, an anthropologist and archaeologist from the University College London, proposed one of the more outlandish theories about the case. Murray argued that Bella had been executed during an occult ceremony and that her hand was removed to be used as a “Hand of Glory.” A Hand of Glory was a dismembered hand used by burglars as a candle that was carried into homes they wished to steal from in order to make the inhabitants fall asleep. The problem with this theory was that a Hand of Glory had to be cut from the body of a felon who had just been hanged at the gallows. Murray also linked the Bella case to the murder of a man named Charles Walton in nearby Lower Quinton, who was killed with a pitchfork. Although Murray was a pioneering archaeologist and anthropologist, she did have a tendency to see witches everywhere. She wrote several books on the history of witchcraft in Western Europe and proposed in one that there was secret cabal of witches that infiltrated the highest levels of English nobility and knocked off a number of kings. Murray’s ideas seem to be the basis for the rumor that was popular between 1943 and 1953, that Bella been killed by gypsies during an occult ritual. In 1953, a reader, referring to herself as Anna, wrote a letter to Byford-Jones and claimed that Bella was part of a WWII-era spy ring sent by the Germans to get intel on the area’s munitions factories. Anna wrote that this spy ring was made up of “ a Dutchman, a foreign trapeze artist, and a British Army officer.” She said the British officer, who was a relative of hers, had been spying for the Germans, and that Bella was a Dutchwoman named Clarabella Dronkers who had known too much. Anna said the officer and his friend, a trapeze artist performing at the Birmingham Hippodrome, killed Bella and disposed of her body in the Hagley Woods. Byford-Jones and the police believed it was possible that spies were in the area during World War II because there were a lot of factories that were essential to the English war effort and knowing the locations of these factories would have been valuable info for the Germans. The police and MI5 looked into Anna’s allegations, although some of her statements were verified, the information went nowhere and the case went cold again for another 40 years. When the West Mercia Police published their case file after the investigation was officially closed in 2009, it was discovered that Bella’s bones had disappeared. After Dr. Webster examined the bones in 1943, he sent the remains to a friend at the University of Birmingham for some unofficial tests, but there are no records about what happened to the remains after that. This caused some people to speculate that this was proof of a cover-up at the highest levels of government. Then MI5 declassified their file on a Gestapo agent they interrogated named Josef Jakobs. Josef Jakobs was arrested by the Home Guard, a volunteer organization that protected England’s coast and strategic factories during WWII, after he parachuted into Cambridgeshire in January of 1941. In Jakobs’ file was a photo that he had when he was captured. Jakobs told MI5 that the photo was of his “lover,” a German woman named Clara Bauerle. He said that Bauerle was a cabaret singer and actress, and the two met at a Café in Hamburg where she was singing. He claimed that Clara was recruited by senior Nazis because she spent a few years performing in the West Midlands and could speak English with a Birmingham accent. Jakobs said that Clara was supposed to parachute into the Midlands after he had made “radio contact,” but he doubted she would make the journey since he was arrested before he could communicate with his team. Josef Jakobs was executed by a firing squad on August 15, 1941 and was the last man to be put to death in the Tower of London. Clara Bauerle is a plausible candidate for “Bella” because Clara was born in Stuttgart in 1906 so she would have been 35 if she died in 1941. Also English-speaking audiences could mishear her name as Clara Bella. According to news articles, Clara’s singing and acting career came to a sudden end in 1941. The idea that “Bella” was Clara Bauerle seems to be the most popular theory right now and it’s convincing. Other theories are that Bella was the girlfriend of a GI and she was murdered when she became pregnant, she was prostitute, or a local who died when she took shelter in the tree during a German air raid. Although closed, the case remains unsolved. Unless “Bella’s” bones are found and subjected to a DNA test to see if they belong to Clarabella Dronkers, Clara Bauerle, or someone else, we may never know who she was or who stuffed her body inside that tree. The graffiti continues to appear, most recently someone wrote “Who put Bella in the Witch Elm?” on the side of a 200 year old obelisk on August 18, 1999. The wych elm that served as Bella’s coffin for at least 18 months still stands in the Hagley Woods. This post was syndicated by Forensic Magazine. 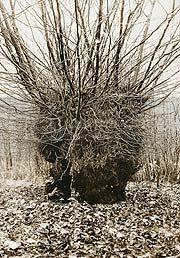 One thing: the word “wych” applied to trees, as in wych elm or wych hazle, has nothing to do with witches, but means “twisted.” Not all readers may be clear on that. But it’s a great story, and the connection with Margaret Murray interests me. I should have said “bendable” or “twistable” rather than “twisted.” My error. Reblogged this on STYLEBOOK MAGAZINE. Cool story! Love Forensics. I still like thinking of it as Wych Elm for Witch Elm. Ignorance is bliss..right!? Reblogged this on The Retreat. Thank you for your article, it is a really interesting story indeed. I wonder why her bones disappeared, and if someone tried to get rid of the evidence. It is a real mystery! And I have a feeling that we will one day hear more about it. This was interesting, it’s funny how people can jump so far into their own conclusions. It’s also a fun way to take something such as an unsolved murder or death and put a story behind it. You’ll see a few of those things on my blog. I have a morbid sense of curiosity and writing stance. I also just have a morbid out look on life. Awesome story, who needs movies? Reblogged this on BadPair Studios. Reblogged this on diary of a black gurl. Great story! Congrats on being freshly pressed! I created a new page last month called Real Life Natural Wife. I hope you’ll check it out and leave me a comment with your thoughts. Have a great weekend! If the skeleton was in fact the singer/actress, who killed her and how did she end up there in that tree? Nope-I was really surprised. The first time they sent me an email. Unless it ended up in my spam. Very interesting mystery. Congratulations on being freshly pressed. Enjoyed. Was a good read. Interesting. This is a great story.. you got me intrigued. Reblogged this on Chaosmammoth's Blog. Who put Bella down the Wych Elm? | Auf den Spuren von: "Oh wie schön ist Panama"